Now that I'm back in Los Angeles (YAY! ), I feel the need to exhibit my happiness with bright, sunny colors. Enter Dior #319 Sunwashed. 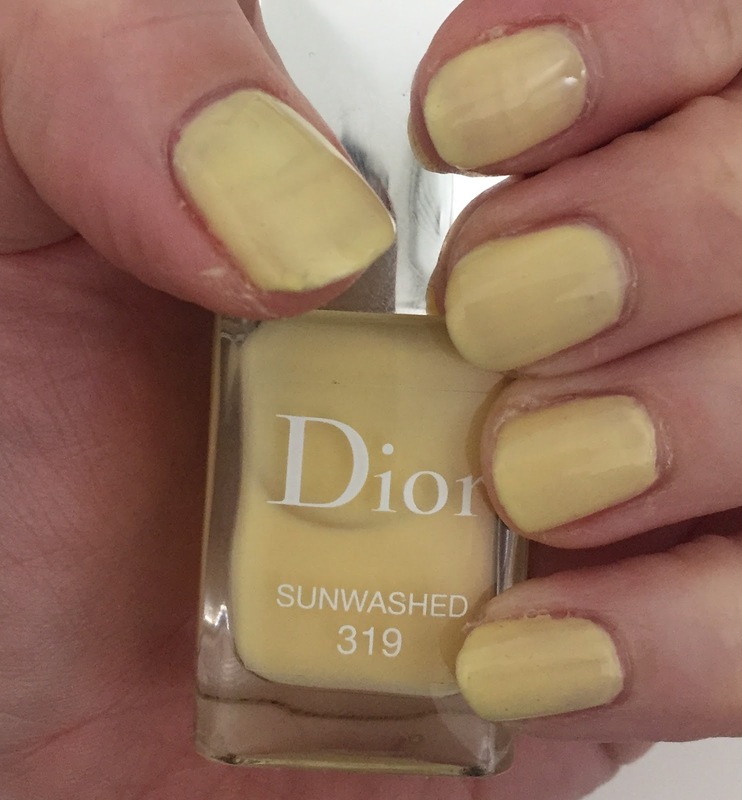 I'm typically not a fan of yellow nail polish, especially since I'm so pale, but this is one of those shades that's flattering on every skin tone -- even ghostly Casper white like mine! It's just creamy and yellow enough to stand out and not make me look sickly. Another shot of Dior Sunwashed. I love its unique mix of faded and bright! This polish definitely builds with each coat, so it can look streaky or patchy if you don't do at least two. I applied two coats here, which I think supplied adequate coverage. And while I love it on my hands, I think it would be perfect for a summer pedicure! I was actually gifted this polish right when I got back to LA yesterday! My lovely friend Kerry picked my mom and me up at the airport and she gave it to me over brunch. I haven't had any Dior polishes to play with in quite some time, so I was definitely excited to add it to my arsenal. 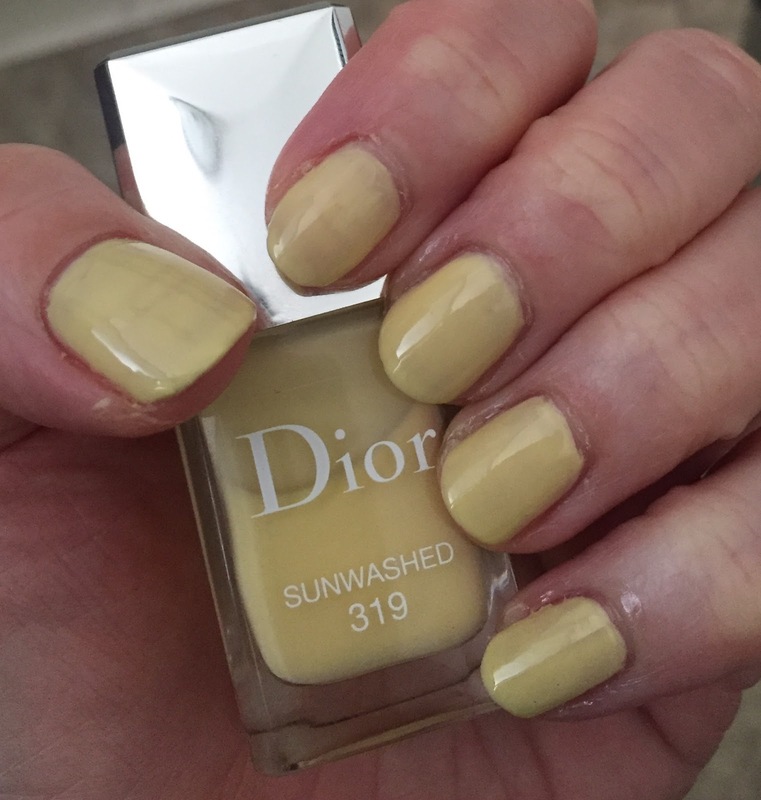 Dior #319 Sunwashed retails for $27 at saks.com. Welcome back to LA, Jamie! Love this color, and definitely love the idea of this shade for a pedi! Thank you so much, Allison! And I totally agree. What a nice welcome home gift. I like that this is such a soft yellow. Yellow can be so hard. It looks nice on you. It usually is terrible on me. Aww, what a sweet welcome! I'm not usually a yellow fan either, but I can make an exception for this shade. I'm so glad that you're back in LA. :D That is a pretty yellow, so fresh and bright for the season. What a lovely color for spring & summer! I love soft, muted yellows. What a fun color! I've never tried yellow polish. Yay - glad your back to LA and doing better. :) Such a sweet color for Spring and Summe.r.. I love soft yellows though I don't use them often. Such a great Spring shade! Fun mani! It must be good to be home! What a lovely gift to receive! I love this shade, though I can't pull off yellow polish either - it clashes with my yellow undertones.